Civil's plan is complex, but if it works the way organizers hope, it might just usher in a new age of journalism. Hackers, scammers, gamers, DIY-ers — the internet has been a boon for a lot of people. But for media, it’s largely been a disaster. Newspapers and magazines are trying to balance keeping their content affordable, accessible, and accurate, while still making enough dough to keep operations afloat. Information not trapped behind paywalls or subscription models runs the risk of being sponsored content, or just plain wrong. Social media has inflamed the issue, allowing users to share untrustworthy and unsavory news while dispensing with the traditional markers that would signal readers to be skeptical. The result: our current age of mistrust and misdirection, rife with well-financed “fake news.” And no one knows how to fix it. Facebook is expanding its army of fact checkers and moderators to stem the tide of misleading information on its platform. Congress is caught up in futile hearings about political bias in content filtering practices by social media giants, evading discussions of much more pressing matters (hint: they involve Russia). A new startup thinks it might have cracked it. Civil wants to be a platform where independent newsrooms can foster direct relationships with their readers, who can have a real stake — in the form of cryptocurrency — in supporting publications they trust. It’s an ambitious project with a lot of moving parts, but the experiment is already underway. Back in October 2017, the Brooklyn-based company received $5 million in funding from blockchain platform ConsenSys, and expanded its operations to 24 full-time staff members. Now, with its token launch (what others in the same position might call an ICO or Initial Coin Offering) slated for August 13, more people are going to have to ask themselves: will it work? Here’s how it’s supposed to work (it’s a little complicated, so stick with me). Every community member (readers and journalists) gets to invest some of their real-life money to buy a certain number of Civil tokens. If readers think a particular newsroom is unethical in some way, they can “challenge” it (details of the exact process are still unclear). Anyone with Civil tokens gets to vote on what they think is the right or “ethical” side by gambling their Civil tokens towards it. Betters in the majority get rewarded with more tokens; those in the minority won’t, unless they themselves challenged a newsroom. The same tokens could also be used to pay journalists (or at least tip them), using the smart contracts inherent to blockchain to set up a transparent kickback system for writers, editors, and illustrators that readers want to support. But Civil plans to leave the business decisions entirely to the newsrooms themselves. “We think it’s important for newsrooms to maintain full independence from The Civil Media Company, as we never wish to exert undue editorial influence on them — even if it means an ‘anti-Civil newsroom’ launches on Civil — as long as they play by the rules, it’s fair game,” Civil Media Company co-founder Matt Coolidge tells Futurism. Yes, despite its laissez-faire attitude towards the business practices of individual newsrooms, Civil has done a lot to try to make sure only the most deserving news sources end up on its platform. The company is still in the process of crafting a full-blown Constitution that lays out Civil’s journalistic standards in detail. One of the elements the Constitution demands: a Civil Council, made up of journalism heavyweights. Civil Foundation CEO Vivian Schiller will appoint the Council (readers will appoint the next round) that will act as a court of appeals for any newsroom challenges that are particularly controversial and involve one or multiple infractions of the Constitution. “[The Constitution] is the foundational document for all activity that occurs on the Civil platform. And more broadly, what will ensure that Civil is above all always rooted in its commitment to be a marketplace for sustainable journalism, where journalists are beholden to their readers above all else,” Coolidge says. Rogue actors that want to sway challenges in their favor by buying up a bunch of tokens — like, say, a group of alt-right readers who invest a bunch of money to discount credible news sources they disagree with — would be easy to spot. Huge sums of tokens changing hand could trigger an alert. And thanks to Civil’s extremely rigorous and lengthy registration process— multiple journalists have already failed their entry quiz already — Civil would already have each community member’s anonymized information (unique cryptowallet addresses), making the rogue actors identifiable. Any anomalous behavior could then be challenged with a vote. If this works the way Civil thinks it might, everyone wins: journalists and newsrooms would be able to support themselves and move away from a business model that relies on capricious ad revenue; readers can have confidence in what they read because they’ve voted with their wallets to support only the good stuff. 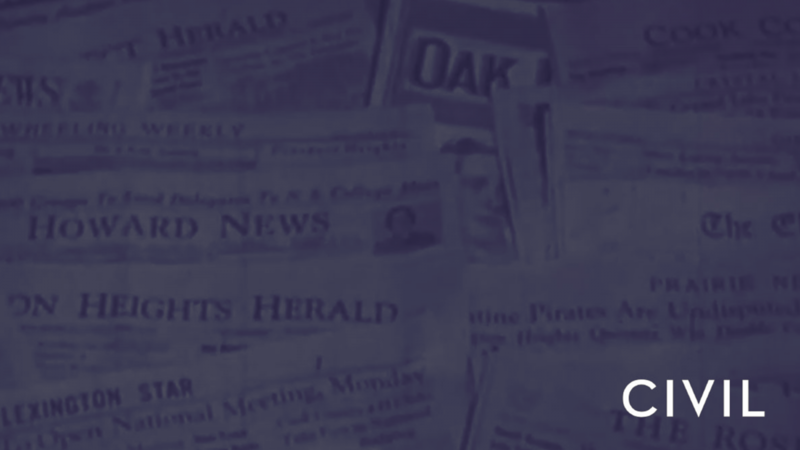 Civil is also planning to give newsrooms the ability to send every piece of content to its Ethereum-based blockchain, making any existing news content near impossible to tamper with, effectively ending any form of censorship. And we already have proof that blockchain can actually stop censorship: Chinese internet users managed to circumvent their government’s strong-handed censorship practices by adding an investigative piece about a vaccine maker inside the metadata of a blockchain transaction. But whether the Civil platform will actually catch on is practically impossible to tell at this point. On August 13, Civil will launch 100 million CVL tokens as part of its token launch. It will reserve 33 percent of those tokens for itself; another third it will give out as grants to “mission-aligned third parties” (more details will emerge as we near the token launch, Civil has assured me). The remaining 34 percent it intends to sell. If it does, their total value won’t exceed $32 million (this is called a hard cap — the fixed number of coins that will be issued also determines the value of each token). Some who already established businesses on the platform are frustrated with this. Too high of a hard cap, and a token’s value would be diluted; too low and the token launch may have trouble getting off the ground. And Civil decided to set that bar relatively low. Realistically, even if the tokens reach their absolute highest value, they wouldn’t be able to support entire newsroom operations immediately; depending on how the ICO goes, a single token will only be worth 24 to 94 cents. Newsrooms and journalists will feel the heat. Even thousands of tokens wouldn’t be enough to pay a single journalist’s salary. So for now, they will have to finance their operations the old fashioned way, instead of relying entirely on Civil’s cryptoeconomy. As part of their podcast ZigZag, veteran journalist Manoush Zomrodi and radio producer Jen Poyant started creating a media business on Civil’s platform. And the duo is not all that excited about the ICO. “Not that we’re going to get Lambos, you and I. But the money we could have gotten out of this sale [Civil’s token launch] would fund our business the way a venture capitalist may have done,” says Jen Poyant in Chapter 7: A New Frontier for Journalism?. “But that’s definitely not going to happen.” Instead, they will still have to rely on conventional venture capital to support their business, not just CVL tokens. By launching its token at such a bargain basement rate, Civil seems to be insulating its token from speculation, to ensure its value doesn’t oscillate as bitcoin’s has in the past. 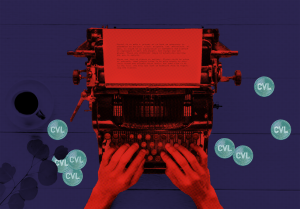 “CVL is meant to play a critical utility in the ongoing self-governance of the platform, not to be a speculative vehicle of any kind,” Coolidge says. In other words, Civil’s token is there to act as a vote, or a way for you to keep unethical news off the platform — specifically not a get-rich-quick scheme. Since no one one is going to make beaucoup bucks from the token launch, fiat currencies are still essential for everything to work, at least for the time being. “The forthcoming CVL token will unlock a lot of additional community features, but many Civil-newsroom contributing writers, editors, and illustrators are currently being compensated for their work in fiat currency,” David Moore, the founder of Sludge, one of the first newsrooms to be built on Civil’s platform, tells Futurism. But he is hopeful about creating incentives for freelancers by paying them in Civil tokens. There are, of course, a lot of questions about how Civil will work that are still impossible to answer. What will a Civil-powered comments section actually look like? Will journalists ever be remunerated entirely in tokens, or will they have to rely on income through conventional means? Will readers’ ability to exert such a direct influence on the kind of news they read create healthy conversation with lots of opposing viewpoints, or create an echo-chamber just for one? This article previously mischaracterized several aspects of Civil’s platform works. Users can lose tokens during a challenge only if they bring up the challenge, not if they vote for the losing side. Also, Civil does not store community member data — it only stores anonymized cryptowallet addresses. The article has been updated to reflect the correct information. We regret the error.